Goodhouse looks after your whole project. We develop a 'one off' response to each brief, however our system remains the same. The construction system, details, selections pallet and processes have all been carefully considered and chosen, so what we offer is a complete integrated system. We work alongside you to develop a design that answers your brief and responds appropriately to your site. We then coordinate a preliminary costing process with the builder. Once you are happy with the design and the projected cost, Goodhouse then works with our Engineer, Energy Assessor and other consultants to produce full documentation. We lead you through the selections process and recommend any appropriate integrated systems that may be required. We look after all Council Approval processes, Certification, coordinate final pricing and Building Contract negotiations. When in contract and under construction, we work closely with the builder to deliver and certify your Goodhouse. Goodhouse works with you to design and deliver a sustainable home at an affordable price. As each Goodhouse is unique, the design responds to existing site conditions as well as client driven requirements. Each Goodhouse is designed to maximize ‘passive solar’ principles. Orientation, solar penetration, shading, cross and stack ventilation are all carefully considered and modelled. Important to our environmental philosophy is the provision for outdoor living spaces that respond to the varieties of climate and connect to the internal spaces. It is this visual and spatial connection that encourages people to interact with the operation of their home and work with the local environmental conditions. Another Goodhouse environmental philosophy is to minimize the built form footprint in order to reduce the embodied energy and financial cost of each build. Each Goodhouse is economic in the use of space without compromising the feeling of openness and connection. Goodhouse works alongside our suppliers, builders and specialist trades and consultants, in order to maximize process efficiency. Because Goodhouse is effectively a pre-considered and pre-costed system, clients can be confident of build price range at an early stage. 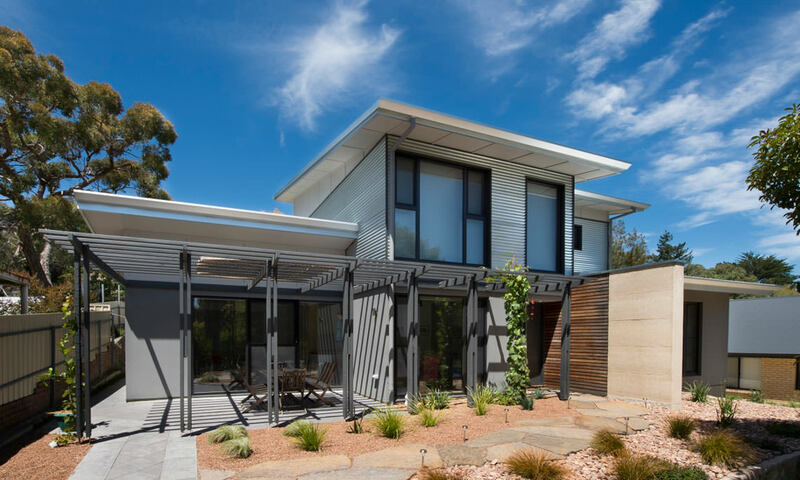 With high quality fixtures and fittings, polished concrete floors, internal rammed earth and UPVC double glazed windows all as standard we believe that a Goodhouse offers exceptional value compared with the current market. The Goodhouse system offers a sustainable and budget conscious alternative to a wide market. Goodhouse is now a possibility for people who value energy efficiency, healthy environments and spaces that are connected to the environment. It is our aim with Goodhouse to deliver a quality product that has the potential to make more energy than it uses and maximises the passive heating and cooling options available on site. Energy data from current completed GH’s is showing that they are generating more energy than they are using. They are consuming on average 1/5th of the kW/h usage when compared to the average local area energy consumption. We have also had a Goodhouse monitored for 12 months to show internal temperature alongside external temperature. This clearly shows how the Goodhouse combination of a well-sealed and insulated building envelope, internal thermal mass and passive solar design will work together to provide very stable internal temperature year round.